Hicksville Public Schools » Athletics » Alumni News! Scarpa currently ranks second in Conference Carolinas in assist (27), while ranking fifth in points (61) and ninth in goals (34). 2018: Has started all 29 league matches since being acquired on March 5 ... tallied one goal and two assists in 2,610 minutes played ... helped tally 13 of New York's league-best 14 shutouts. International: Called into the USMNT June camp, earning his first career cap against Ireland before his first career start against France ... tallied second call up with the USMNT for the September camp with international friendlies against Brazil and Mexico ... earned his third consecutive call into the USMNT camp for October against Peru and Colombia. Playoffs: Started both conference semifinal matches ... helped pitch a shut out against Columbus in Leg 2. 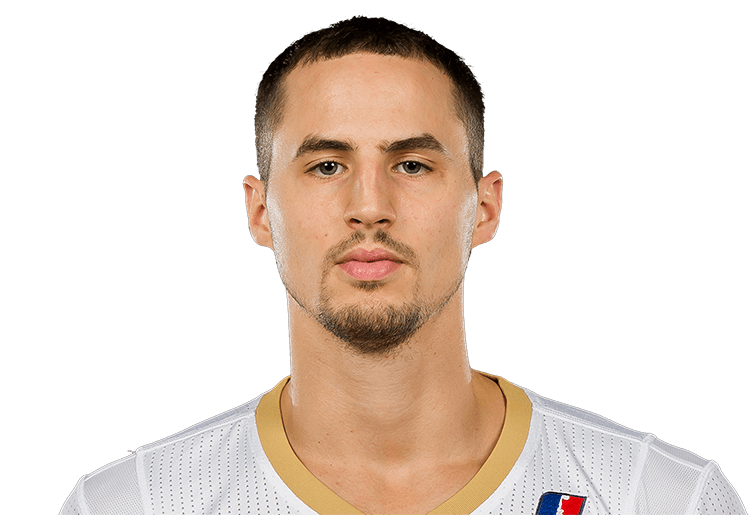 John Petrucelli is a guard for the NBS -D League Lakeland Magic. He played college basketball at Molloy. The Orlando Magic have signed free agent guard John Petrucelli, President of Basketball Operations Jeff Weltman announced today. Petrucelli (#12, 6’4”, 190, 10/27/92) appeared in 43 games (seven starts) last season (2017-18) with the Lakeland Magic of the NBA G League, averaging 8.3 ppg., 4.1 rpg., 1.2 apg. and 1.28 stlpg. in 20.9 min pg. He has played in 75 career NBA G League games with Erie and Lakeland, averaging 7.1 ppg., 3.6 rpg., 1.3 apg. and 1.09 stlpg. in 21.0 min pg. Petrucelli spent two seasons (2014-16) in Slovakia after playing collegiately at Molloy College (NY). 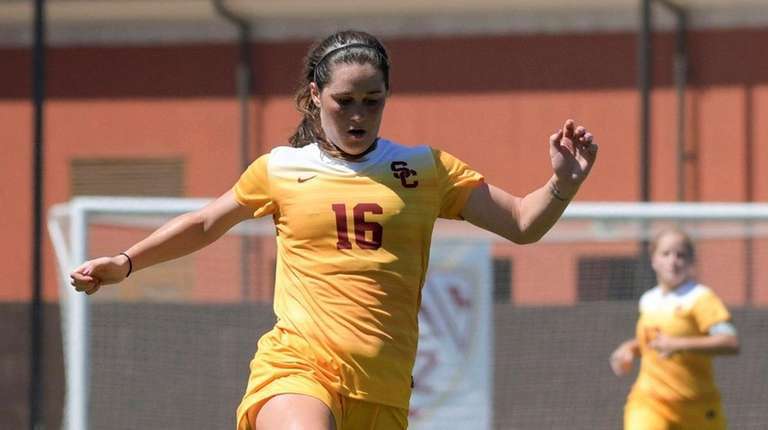 Former Hicksville star and USC midfielder Amanda Rooney has signed a contract with Lithuanian women’s soccer club Gintra-Universitetas. Gintra is a member of the A Lyga, the top division of Lithuanian women’s soccer. The club advanced to the UEFA Women’s Champions League Round of 16 in 2017 and will return to the tournament in August after winning the Baltic League last year. March 30, 2018-Amanda Rooney, who spent many years playing in the Long Island Junior Soccer League (LIJSL) and for the Olympic Development Program (ODP) of the Eastern New York Youth Soccer Association (ENYYSA), is headed to Europe to play professionally. She signed with Gintra Universitetas, Lithuanian champions for the past 13 seasons, and will be joining the club next month. The now 22-year-old from Hicksville played for the LIJSL’s Albertson Elite Fury for eight years and served as the team captain, competed for Eastern New York ODP for six years and for Region 1 ODP for five. She hopes to add some national championships in Lithuania to the two she already won in the United States, playing for the 2009 Long Island Fury in the Women’s Premier Soccer League (WPSL) and the 2016 NCAA title as a member of the USC Trojans. Additionally, she was named to the 2014 WPSL All-Star Team and was a member of the National Team Pool for two years. East Coast Conference Rookie of the Week. Colleen claimed first-place in singles play at the Blue and Orange Classic, knocking down 628 total pins while averaging 209.3. The rookie paired in doubles competition for a fourth-place finish, helping the Lions take the team title at the event. 2017: IWLCA First Team All-American… Named ECC Offensive Player of the Year… IWLCA First Team All- North Region…First Team All-ECC…First Team All-ECAC…Two-time ECC Weekly Honor Roll… IWLCA Division II National Offensive Player of the Week…Two-time ECC Offensive Player of the Week…Finished the season with a team-high 71 goals and seven assists for 78 points…Set an NCAA Division II single-season record for draw controls with 182 and was second nationally in draw controls per game…Added 30 caused turnovers and fired off 102 shots on goal to earn a 84.0 shots on goal percentage…Recorded her 100th career goal and point during the season… Had the best game of the season on April 7 when she recorded a game-high six goals and eleven draw controls in the 18-5 victory over Roberts Wesleyan College. 2016: Named to ECC Commissioner’s Honor Roll... Named ECAC Rookie of the Year... Tabbed First Team All-ECAC...Received IWLCA All-North Region Third Team honors… Named ECC Rookie of the Year…Named First Team All-ECC… Named ECC Player of the Week on March 7th…Received ECC Rookie of the Week three times (4/4, 4/18, 4/25)…Earned ECAC Rookie of the Week on April 26th…Tabbed to ECC Weekly Honor Roll twice (3/21, 4/11)…Played in and started in all 19 games… Ranked second on the team with 43 goals and 56 points… Finished with 13 assists… Led ECC and set single-season school record with 100 draw controls… Paced team with 43 groundballs… Ended season with 17 caused turnovers… Scored multiple goals in 12 games and finished with double-digit draw controls in three contests…Recorded career-high nine points on eight goals and an assist against Merrimack on March 5th…Tallied six goals in Mavericks win at Georgian Court on April 20th… Secured career-high 16 draw controls against Bridgeport on April 13th. 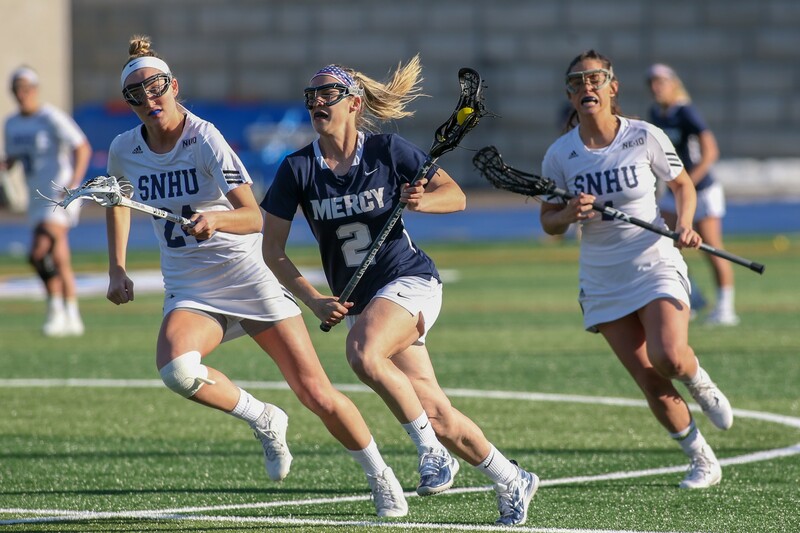 2018: Top Performances: Poetzsch netted her second hat trick of the season. The sophomore leads the Lions in goals (7) and points (16). Dana led the team in points (16) Shots on Goal (38) GW (3) Goals (7) Assists (2) and was 5th in minutes played (1238) 2017: Named ECC Rookie of the Year and All-Conference First Team… Earned D2CCA All-East Region Second Team honors…Played 18 games, starting 16…Logged 1,304 minutes...Led the league in goals (16) and points (34)… Tallied two assists… Recorded five multi-goal contests…ECC Offensive Player of the Week twice (Oct. 2, Oct. 30) and Rookie of the Week once (Sept. 11)…Netted hat tricks in the Lions' 3-0 victory over Daemen (Oct. 28) and the 5-5 draw against Georgian Court (Sept. 28). PATRICK McCORMICK HOISTS THE NATIONAL CHAMPIONSHIP TROPHY FOR NORTH CAROLINA!! Patrick McCormick #9 (Hickville Class of 2014) of the North Carolina Tar Heels holds the trophy after the game against the Maryland Terrapins in the NCAA Division I Men's Lacrosse Championship at Lincoln Financial Field on May 30, 2016 in Philadelphia, Pennsylvania. The Tar Heels defeated the Terrapins 14-13. On March 2, 2018, Parker was traded to New York Red Bulls in exchange for Felipe, $500,000 in targeted allocation money and a 2018 international roster slot. [ On March 6, 2018 he made his Red Bulls debut, appearing as a starter in a 2–0 victory in Mexico over Club Tijuana in the CONCACAF Champions League. On September 30, 2018, Parker scored his first goal for New York in a 2–0 victory over Atlanta United. On June 29, 2016, Parker scored in his second straight Canadian Championship Final. Vancouver would end up losing the match in added time to Toronto FC. He scored his first MLS goal on May 20, 2017 in a 2–0 victory against Sporting Kansas City and was later named to the MLS Team of the Week. Tim Parker, 21, joins Whitecaps FC after spending four seasons with the St. John's University Red Storm of the National Collegiate Athletic Association's (NCAA) Big East Conference. The 6-foot-2, 195-pound centre back appeared in 79 of 80 Red Storm matches over the past four seasons, starting all but one of his appearances. Parker finished with four goals, two game-winners, and four assists, while anchoring a back line that posted 30 clean sheets. He also helped lead St. John's to three straight NCAA Tournament appearances (2011-2013) and the 2011 Big East Tournament title. A native of Hicksville, New York native, Parker earned Big East honors in each of his four seasons with the Red Storm, including first-team honors as a senior and junior. He was also the program's first three-time NSCAA All-Region selection since Chris Wingert (2001-2003). 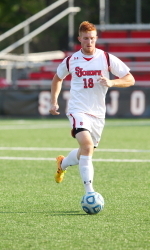 Prior to his collegiate career, Parker was named a second team ESPN RISE All-American and was the Gatorade New York Boys Soccer Player of the Year. He was also a member of the United States U-18 men's national team pool. Parker, who captained the Red Storm this past season, earned a pair of first-team NSCAA All-Region selections to go along with a third-team nod as a senior. Also of note, the defender led St. John's in minutes played in two of his four seasons at the school. Senior finance major has helped lead Red Storm to three-straight NCAA Tournaments. QUEENS, N.Y. - Senior defender Tim Parker has been selected as one of 30 men's soccer candidates for the 2014 Senior CLASS Award. To be eligible for the award, a student-athlete must be classified as an NCAA pision I senior and have notable achievements in the areas of community, classroom, character and competition. An acronym for Celebrating Loyalty and Achievement for Staying in School, the Senior CLASS Award focuses on the total student-athlete and encourages students to use their platform in athletics to make a positive impact as community leaders. A team captain and a three-time BIG EAST All-Academic selection, Parker has a 3.09 GPA as a finance major. The defender has been involved with numerous community service initiatives, including Relay For Life and St. Nick's Men's Shelter as well as the Community Mayors program. Named to the MAC Hermann Trophy Watch List in each of the past two seasons, Parker is a two-time first team NSCAA All-Northeast Region honoree. A first team All-BIG EAST honoree as a junior, the defender earned second team all-league accolades as a sophomore and was a BIG EAST All-Rookie selection as a freshman. Parker has appeared in all 62 games in his career, including 61 starts, and has helped the Red Storm reach the NCAA Tournament in each of the past three seasons. The defender has registered three goals, two game-winners, and three assists, while leading a defense that has posted 28 shutouts in the past three seasons. The candidates will be narrowed down to 10 finalist's midway through the regular season. Those finalists will be placed on the official ballot, which will be distributed to media, coaches and fans through a nationwide voting system. The winner will then be announced during the 2014 College Cup in December. Tim Parker is one of 30 men's soccer candidates for the Senior CLASS Award. In the minor league portion of the Rule 5 draft, the Mets lost several players, including Cam Maron, a catcher who grew up in Hicksville who was then selected by the Cincinnati Reds organization and will be playing for the Triple AAA Louisville Bats team. Cam Maron, 23, was originally selected by the Mets in the 34th round of the 2009 amateur draft. He's a .284 hitter with a .387 on-base percentage in six minor league seasons. Maron spent most of 2014 season with Single-A advanced St. Lucie, batting .282 with a .387 OBP and three home runs in 98 games. Maron was also an All Star player with St. Lucie. p tables are great to layout website sections on the page! DAYTONA, Fla. - The Florida State League released its 2014 All-Star Team on Tuesday and the St. Lucie Mets are represented by catcher Cam Maron. Hicksville's Cam Maron is one of five year-end All-Stars selected from the Mets' and Yankees' organizations. Maron, a 23-year-old, is batting .284 in 93 games through August 25. He leads the Mets in on base percentage (.394) is second on the team in walks (61). Maron has hit three home runs and and is third on the team with 49 RBIs. Defensively Maron has served as the Mets primary catcher and has caught 91 of the Mets' 132 games. Maron was also a midseason FSL All Star and caught a scoreless eighth inning in the All Star game at Bradenton. This is Maron's second season in St. Lucie. Last year he hit .235 in 84 games for the Mets.